Many aspects of “My Heart Belongs in Gettysburg” reminded me of “Gone With the Wind,” one of my favorite classics. 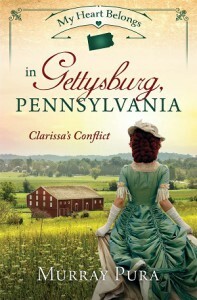 The Civil War setting drew me in, especially since it was set in such a renowned location. In fact, that was one of the striking parts of the reading experience because most of the action took place prior to the famous Battle of Gettysburg, when the town was just a quaint place that outsiders would never have heard of. The heroine, Clarissa Ross, points this out herself, commenting that she does not want her idyllic town and its environs to be remembered for death and destruction. Given all of the tragic events that have occurred even recently in the U.S., this was a reminder that disasters can happen anywhere, and this is where faith comes in as we trust God that He is ultimately working all things for the good of His children. Clarissa was a distinctive character, to be sure. In some ways she reminded me of Scarlett O’Hara, with her stubbornness and her temper. An inimitable redhead, Clarissa was very strongminded and outspoken, which I think was due in part to her being an only child and also to her living in the North. Had she been raised in the South, I think that the patriarchal society there would have had a deeper influence on her and she may have been somewhat more submissive. At first I found her character to be off-putting, but I soon grew to admire her and her antics. The romance, which is usually my least favorite part of a story, was very engaging because it was fraught with both danger and surprises. From a historical viewpoint, I was pleased that this novel pointed out that the Civil War was about much more than just the issue of slavery; states’ rights and the economy were at the forefront of the fighting, especially in the beginning. The many different levels of conflict in the book were well balanced by the Christian and romantic aspects, and I only wish that the story had been a bit longer in order to fill out some of the details more fully and allow for the plot to play out more slowly.